The first and second times I wore this dress I was busted taking pictures of myself. D’oh! This time no one spotted me. I posed in front of a movie theater on the way to work because people don’t usually watch movies in the morning. I’m wearing the dress with blue tights again but I changed the boots and accessories. I think the Fluevogs make this outfit funkier and less dressy. I bought this necklace at H&M. It reminded me of necklaces I made as a kid using pieces of colorful drinking straws threaded with yarn. 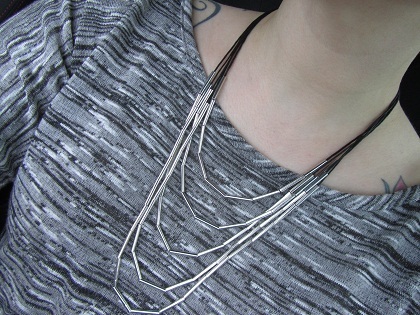 This is made of silver-tone plastic tubing and black string. A grown-up version. This ring was a great find in Florida. 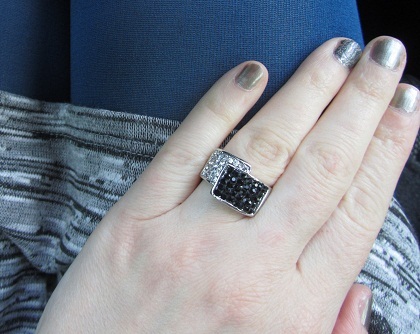 I like how it looks like diamonds but was only $5. I’m guessing they’re fake. Oh well. I’m sick of victim-blaming. It’s not just Indonesia. The SlutWalks that started in Canada and spread around the world draw attention to the same issues women face on every continent. As though modestly dressed women are never assaulted. As though men can’t take responsibility for themselves. When I wear a short skirt or dress, I think of the progress we’ve made and the distance we still have to go. Note: I wrote this post up a couple of days ago. 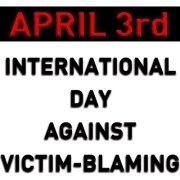 Imagine my surprise when I found out that April 3 is the first anniversary of SlutWalk and is the International Day Against Victim Blaming. 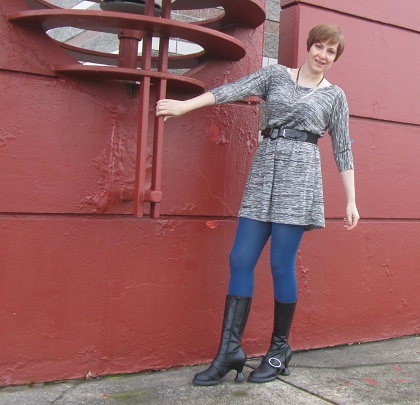 I love your outfit – especially the blue tights. I sorely need to replace my old blue tights but I love them sooo much I can’t bear to throw them out. What a sad story about that insane law!! How ridiculous. As modern Americans it’s so hard for us to hear about such crazy things. Excited to see you Saturday!